Texas A&M football came out with a new retro alternate yesterday. It’s based on the team’s uniform from 1956, when the Aggies won the Southwest Conference championship for the first time in 15 years. Interestingly, the facemask is two-tone — white at the top and bottom and grey in the middle, so the grey bars mimic an old two-bar mask (click to enlarge). The helmet also features vintage Riddell and KRA-LITE brand marks on the exterior shell and chinstrap consistent with those worn by the 1956 Aggie team, as well as a custom painted facemask to simulate the appearance of the single- and double-bar models versions from the period. As you can see in that last photo, there’s also a jersey patch indicating that the ’56 team went 9-0. That’s not accurate — they were actually 9-0-1, with a tie against Houston. Oddly, Adidas’s press release for the uniform mentions the 9-0-1 record, so why try to fudge things on the patch? Weird. 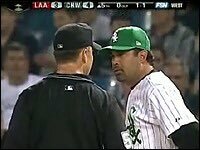 New Era logo creep, continued: Earlier this week I said there was at least one previous instance of the New Era logo appearing on an MLB game cap (that was on April 20, 2005, when the Padres wore the logo-clad caps), but I also said I had the nagging feeling that there might have been some additional examples. But here’s the intriguing thing: After linking to the Chisox shot, I wrote, “[This was] the third time this season that the milliner snuck its mark onto MLB caps.” The first time was the Padres game from April 20 of that year, but what was the second time? I probably I wrote about it at the time, so I poked around in some of my ESPN columns from that year, but so far no paydirt. I’ll keep looking. Looking back, it’s funny that I referred to New Era as a “milliner.” That’s technically inaccurate, because a milliner is actually a maker or seller of women’s hats. But it’s such a good word, and I don’t get to use it very often — maybe that’s why I went with it, even though it was a bit of a stretch. Oh, and speaking of good words: Happy autumnal equinox! I love saying that because (a) autumn is my favorite season and (b) “autumnal” is my favorite adjective. I like how the silent “n” suddenly gains a voice. Isn’t that nice? NFL helmet rule FAQ: Three years after the NFL’s one-shell protocol was enacted, I still get questions from people who don’t understand the rule. So I’ve created an FAQ page that address all (I hope) of the common questions and misconceptions. Hope everyone finds it helpful, and feel free to let me know if I overlooked anything that should be included. Baseball News: For his last home game, Red Sox DH David Ortiz will wear custom cleats with the dates of all his walk-offs. Man, Big Papi was clutch (from @GuySmileys). … On Sunday, Mets P Jerry Blevins wore a standard cap, with an orange squatchee and black underbrim, instead of the proper throwback cap, which has a blue squatchee and grey underbrim (from Vladimir Gonzales). … New gloves for Nebraska. … Mementos from Disco Demolition Night will be displayed at a suburban Chicago museum next year. … A designer drew all 30 MLB wordmarks in Japanese Katakana (from @HoeflerCo). … The Bowie Baysox revealed a logo for their 25th season (from Andrew Cosentino). NFL News: Actress Sofia Vergara’s husband, Joe Manganiello, is a huge Steelers fan. On The Tonight Show, she said that he has Steelers pants, underwear, and a hat and bandana, and that he wears the whole outfit when watching the game at home (from Chris Flinn). College Football News: Virginia Tech is hosting an “Orange Effect” game on Saturday against East Carolina. The Hokies will wear orange helmets, and orange logos and wordmarks have been painted on the field. Fans can buy orange shirts. A “Maroon Effect” game will be held next month (from Andrew Cosentino). … Air Force will wear white-over-blue this weekend. … A Tim Tebow jersey was part of a clue on Jeopardy! last week. The answer was what college he attended (from Chris Flinn). … Have we ever seen a FNOB handled like this before? That’s obviously Mike Carey, a Pitt center, during a game against Penn State in 1973. “What would we call it, LN,FNOB?” asks Gerry Dincher. … Wisconsin-Stevens Point wore white pants two Saturdays ago. The Pointers normally wear mono-yellow (from Michael Bialas). Hockey News: The Flames’ retro red-and-yellow jersey is now officially a third jersey. The set will be worn 12 times this season. … The Blue Jackets released the schedule for when they will wear their third jerseys (from Kenny Saidah). … The Maple Leafs are holding an apparel design contest (from reader MaryPaul). 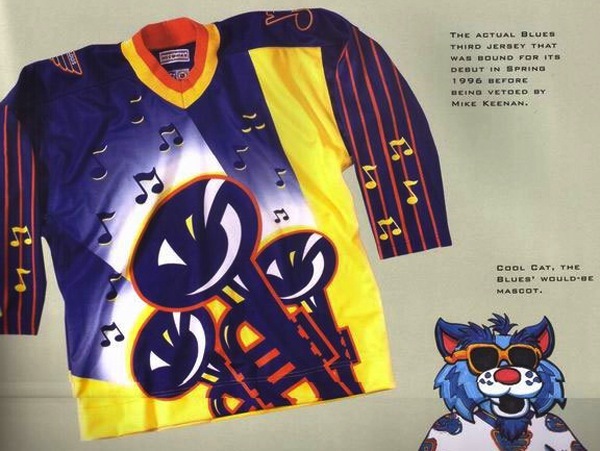 … The Blues had plans for a trumpet-shaped player entrance in 1996. They nearly introduced these third jerseys that year. … The Blackhawks painted their logo at center ice the other day. Pro Basketball News: In addition to bringing back the Hoosiers Hickory High unis, the Pacers will host six “Decade Games” this year, in honor of their 50th anniversary. Seems like in-game atmosphere and entertainment will be retro-themed, but no throwbacks are planned (though they did wear 1990s Flo-Jo unis in late 2015). … The Jazz will renovate their arena, which opened in 1991. … All members of the WNBA’s Indiana Fever took a knee and locked arms during the national anthem prior to last night’s game against the Phoenix Mercury. Two Mercury players also knelt. … Meanwhile, the NBA and the players’ union are exploring alternative forms of protest and community engagement for the upcoming season. NBA rules mandate standing for the anthem. … New uniforms for the Perth Wildcats, an Australian pro team (from Paul Forrest). College Hoops News: New uniforms for Penn State (from Tyler Brackbill). … New uniforms for East Carolina, too (from Russ Friedland). Grab Bag: The logo for UEFA Euro 2020 was revealed (from Griffin Smith, via Phil). … Earlier this year, a famous Toronto discount department store, Honest Ed’s, announced it was closing and sold all of its hand-painted signs (from Ted Arnold). 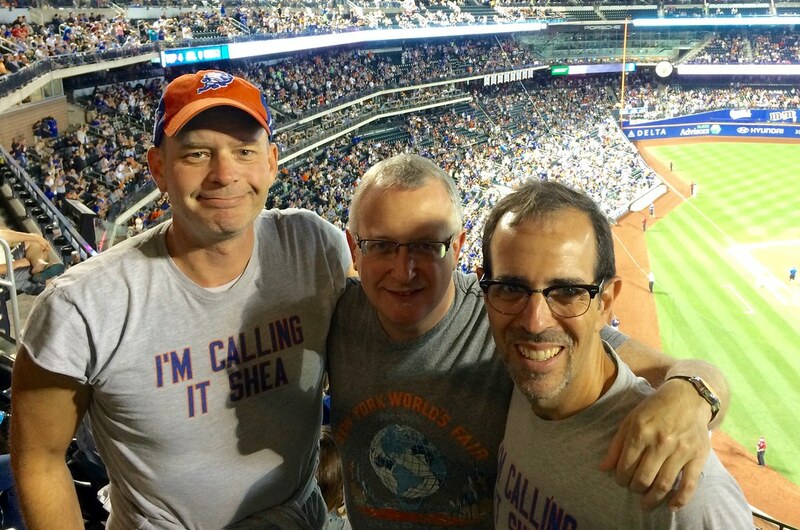 What Paul did last night: Had the pleasure of attending last night’s Braves/Mets game with Uni Watch deputy editor Phil Hecken (left) and uniform/logo design Todd Radom (who, thankfully, didn’t wear an “I’m Calling It Shea” shirt, or else we would’ve looked too geeky even for my tastes). The photo was taken by a beer vendor, who unfortunately didn’t realize that Todd was nearly obscured by shadows. It’s hard to express how great it is to take in a game in the company of two guys who Totally Get Itâ„¢. Big thanks to both these gents for a fine evening of baseball chatter, and doubleplusthanks to Phil for making it happen and scoring the tickets. Tech fans won’t be ‘given’ the Orange effect shirts. The campus bookstore is selling them, as they have been doing for about 15 years now, and 10 for the Maroon effect shirt. They’re really cheap, though – and big sellers on campus every year. Damn. I’m not gonna mess with Phil. The dude is ripped! My thoughts exactly. Looking good, Phil! I thought same thing. Look at that Phil guy now. haha Way to go Phil. Texas A&M unis look nice. The idea of the face mask is a strange idea but I guess the best they can do. Someone needs to draw a rendering of what a Trumped-shaped player entrance would look like. Your helmet FAQ seems complete to me. These A&M uniforms are probably the best thing Adidas has done for that school…ever. YES! The Flames have restored the classic jersey into the regular rotation! I never liked the Stampede-inspired third they’d worn the last few seasons, mainly because of the same problem I have with the Flames’ regular home and road jerseys – TOO MUCH BLACK! Also – should be “trumpet-shaped”, not “trumped-shaped” for the Blues item. I am super pleased with this announcement. Great timing – considering I was just bashing the Flames present day uniform in yesterday’s comments for being complete crap. I am part of the camp that would like to see this classic red and yellow become their full time uniform again. And bring back the white version of it for the road. They won a freakin’ Stanley Cup wearing these uniforms. There are good memories of scary great Flames teams wearing that uniform. 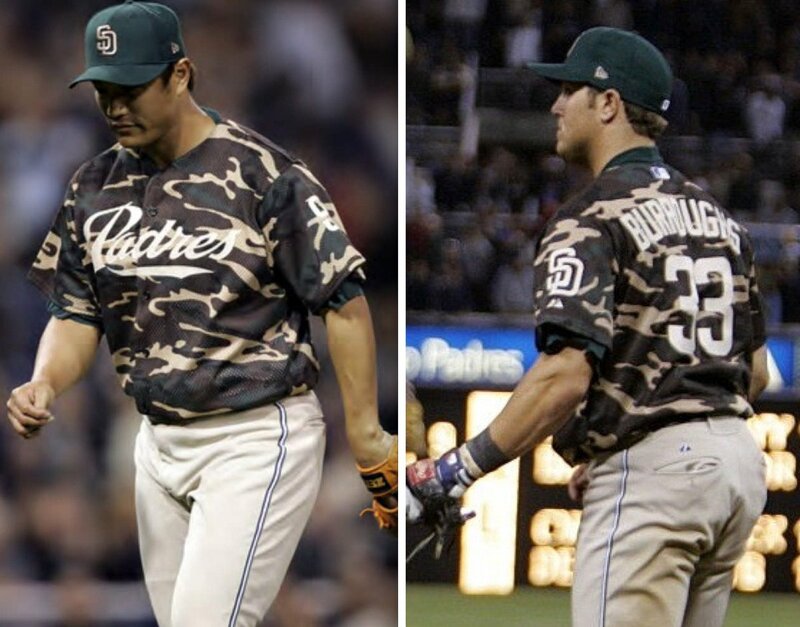 If their fans still want them to wear some black – they could do so on a third uniform. Same thing with the Bills’ throwback helmet – they just swap out the side decals. They swap out the striping tape as well; the current helmet stripes widen in the back, whereas the throwback stripes don’t. Will fix the Bills helmet reference — thanks. Anaheim is misspelled as “Ananheim” on the Big Papi cleat picture. Wonder if that will get changed before the game? I don’t know if this was intentional, but I enjoyed the wording on this. Too often, a woman who is successful in her own right, but happens to be married to an equally successful man, is referred to as so-and-so’s wife. Nice to see the tables turned here. I do think it’s a shame the Pacers won’t be throwing back their unis on those Decade Game nights. It’s a missed opportunity to see some different throwbacks, to be sure. And it’s also a shame they couldn’t work the schedule so that the 60s and 70s games could be against their fellow ex-ABA teams. I remember the Pistons had their own decade nights a few years back, during the lockout-shortened season. It wasn’t an anniversary thing, just a promotion gimmick, but still, I thought the same thing then – a missed opportunity. I happened to actually be at the 70s game against the Grizzlies (I forget who the halftime entertainment was), and felt that it would’ve been great if the Pistons could’ve broken out some Dave Bing-era unis for that game. The Pacers sure had a lot of different uniforms. It might empty the team’s wallet to try throwing back to all of them. Thanks for the helmet faq Paul. It seems to clear up a question I had from last weekends Dolpins-Pats game. I was pretty sure that I heard Ryan Tanehill switched helmets during the game because of a faulty communications system. And I wondered if this violated the one shell rule. BTW, that Broncos throwback helmet is a great reason to scrap that silly rule. The old ‘D’ logo looks terrible on the dark blue helmet. It seems Formula 1 has a similar rule that limits drivers from using multiple helmet designs during a season. The F1 rule was instituted so the fans would be better able to identify the drivers. Because, you know, now having numbers on the cars isn’t easy enough. And those numbers are so ridiculously small that no one can see them on TV! And the drivers heads are not easy to see with the high cockpit surrounds either. And if F1 implements the ‘halo’ device, then it will be almost impossible to see them at all. How I miss the old days of F1 when you could easily tell one driver from another, even on TV, and of course they used to actually race & pass each other too…. When did F1 ever pass anyone? F1 is a glorified PARADE. Vettel was famous for switching designs every Grand Prix. Most drivers would only use a special design for Monaco and maybe their home race. Georgia Tech posted a video of the equipment managers prepping the helmets for tonight’s “white out” versus Clemson. That picture of the throwback A&M uniforms reminded me of something I was thinking about last weekend. A lot of players now a days are wearing tights under their pants, in the NFL they even try to match the sock color (to further blur the whole sock rule). I noticed while watching the Cal-Texas game last week that the majority of Texas players did not wear tights under their pants. It really stood out because of course white football pants are virtually see through once they’re wet with sweat (which was discussed at some point in the comments last week). Anyway I was wondering if it might be a “rule” or something that Texas has in place that players aren’t allowed to wear tights since its rare now a days for players to wear pants only. I don’t know if it’s a rule, but I know some of the Texas players wear tights under their pants when the weather turns cold. Maybe there’s a team rule that they can’t do that until it’s warranted by the weather. If you look around college football, it’s uncommon for players to wear those tights under their pants. Since there’s no “sock length” rule in college, you’ll see all kinds of styles, but not many tights…until the weather cools off anyway. Ha. I was at last night’s Mets game too. So how did that catch look in person, sorry it happened to Mets fans. I like how the katakana version of the White Sox logo is so similar to their regular logo. Susquehanna Univerity (PA) changed its mascot, uniforms and logos to be more politically correct. Original was Crusaders. This piece announces the change but omits fuller coverage. Possibly a few thoughts for UniWatch? The designer of the logos seems to be a big time operation. The colors are nice, as is the bird insignia and “S” monogram. But that nickname is a turd sandwich, plain and simple; what is it about having your arm twisted over your mascot that turns you into pod-people? We ought to be ashamed of how many schools have reverted to calling themselves the “_____ Hawks”. A failure of creativity and initiative if you ask me. By the way, it may not apply to this school, but no Catholic Institution need apologize for calling its teams the Crusaders. How old is that Columbus Blue Jackets third jersey photo? It has Rick Nash in it and he’s been with the Rangers since 2012. I don’t have fancy DVR so I have no way for video or stills. Top of the 6th inning in the Tigers vs Twins this afternoon, Andrew Romine’s old English D fell off of his batting helmet while stepping in the box. While it’s a minor upgrade, the jersey the Pats are wearing tonight, would be an upgrade to their regular dark blue jersey. I’ve said this a few times, but when I first saw the current version of the Pats uniform, many moons ago, on what I think was the HofFame exhibition game, I thought it represented a throwaway design that would not last. How wrong. The idea that a “new” helmet isn’t as safe as one that has been “worn in” is speculation at best (I realize this isn’t Paul’s reasoning, it’s the reasoning the advisory committee came up with and Paul is just writing what he’s heard/read). Maybe 15 or even 10 years ago, there could be some merit to that, but that’s based entirely on the way the interior padding was made back then, and that has significantly changed over the years. Obviously, the shell itself isn’t going to be “worn in”, so it’s really about the padding. Nowadays, padding doesn’t have the “memory” it used to have (much less breakdown of the materials used). Some helmets have memory padding, similar to what you would find on a memory foam mattress, and those ‘bounce back’ almost immediately when the player takes the helmet off. But the days of padding conforming to a players head over the course of a season are pretty much gone. Most high schools in my area (and many college programs) have two sets of helmets: 1 for practices and 1 for games (then there’s the various helmets for programs that have more than one game style). In fact, some players in the NFL use more than one helmet (one for games, one for practice), or at least have as recently as 2 years ago. I don’t know why the NFL has their rule in place. I can only assume it’s because they are in enough hot water with the CTE issue, that they don’t want to be exposed anywhere they can prevent it, so helmets are easy to limit. The truth is, it wouldn’t take much to test new helmets vs. used helmets, to see if there is any difference. I highly doubt there is, and in the event that there is a difference, I suspect the new helmets would perform slightly better (and I’m not sold on there being any discernable difference). I have always strongly disliked the current Adidas football uniform, especially compared to Nike (I’m talking the uniform template, fabric, etc., not necessarily the team design). I HATE the way they put the Adidas logo and wordmark smack dab in the middle of the chest where the teams logo usually goes. I noticed when watching A&M this past weekend that the logo and wordmark was moved to the upper right corner of the jersey (where Nike and UA typically put their logo). Made the Aggies jerseys look WAY better IMO. Too bad they didn’t do that to these throwbacks. I know I’m a day or 2 late on this, but the Tebow item in the ticket is incorrect. Alex gives the contestant the answers, the contestant has to give Alex the question.